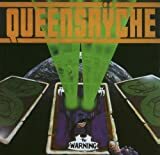 First studio album but second release by QUEENSRŸCHE, "The Warning" is pretty much in the style of their self-titled debut EP: heavy metal in the vein of MAIDEN, with elegance, melodies and only slight progressive touches. Partially inspired by George Orwell's 1984, the compositions, were quite elaborated and refined compared to other metal bands, and deliver an impression of grace carried by Geoff Tate's incredible vocal range. The powerful and epic opener "Warning" is just great! "En Force" is also nice with its galloping riff, whereas "Deliverance" is a little more original with its melody changes. More complex and melancholic, "No Sanctuary" calms down the pace, while the cool "N M 156" sounds a bit futuristic. More personal and in the style of QUEENSRŸCHE's next opuses, the aerial "Take Hold The Flame" is touching, due to Tate's particular plaintive and piercing singing. On the contrary, "Before The Storm" and "Child Of Fire" are neither very original nor remarkable, but remain however pleasant. More interesting is the 10 minutes mini-epic "Roads To Madness", the only genuine progressive track of the disc. On a dark and haunting ambiance, this evolving suite alternates slow, thrilling and hazy atmospheres, as well as heroic passages. One of QUEENSRŸCHE's best tracks from the 80's. 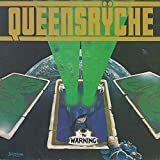 THE WARNING is the first full album by QUEENSRYCHE following the self-titled debut EP that was released the year before. This is very much NWOBHM with few progressive elements that would start to really take off on the following album, however at a time clocking in at 9:40, the final track “Road To Madness,” is the band's first dip into the prog territory that they would later become known for. I actually find this album a little disappointing. After the dynamic debut EP where every song was a catchy metal powerhouse, I just don't seem to be able to connect to the songs on this one as much. It starts off with the first track “Warning” that I just find a little weak and that continues throughout the album. It seems to me that the fury of the first album has waned a bit and at the same time I can hear the proto-sounds of the proto-prog metal that the next album would be. It's an OK listen and some of the tracks like “Deliverance” really do it for me. Just turns out to be one of my least favorite early albums. "The Warning" is the debut full-length studio by US power/heavy metal act Queensrÿche. The album was released through EMI Records in September 1984. Queensrÿche was formed in 1981 as The Mob, but changed their name to Queensrÿche in 1983, which is also the monicker which was used when releasing the "Queensrÿche" EP in 1983 (the band´s first label release). Stylistically the music on the album is US power metal/heavy metal with a slight progressive edge, which is more or less a continuation of the sound introduced on the "Queensrÿche (1983)" EP. At this point in time the term "Progressive Metal" had not yet been coined, so while Queensrÿche are often labelled a progressive metal act it´s actually only half the truth. The music style on "The Warning" is closer to the music of Iron Maiden than it is to the music of Dream Theater and their ilk. Queensrÿche are an exceptionally well playing act and with a distinct sounding and incredibly skilled vocalist like Geoff Tate in front you have a winning formula. The reverb laded sound production may sound a bit dated today, but back then this was pretty surely perceived as a really well produced album. The material on the 9 track, 48:38 minutes long album is also both powerful and well written and already this early on, Queensrÿche had quite a unique sound. So the tracks are generally quality material ranging from powerful heavy/power metal tracks to more epic material like the 9:40 minutes long album closer "Roads to Madness". In terms of progressive structures and playing, that particular track, is the track on the album which best represents that part of Queensrÿche´s sound. It´s not representative for the overall style of the album though. In addition to "Roads to Madness" other highlights include "Take Hold Of The Flame", and "En Force", but as mentioned above all material on the album is of a high quality. 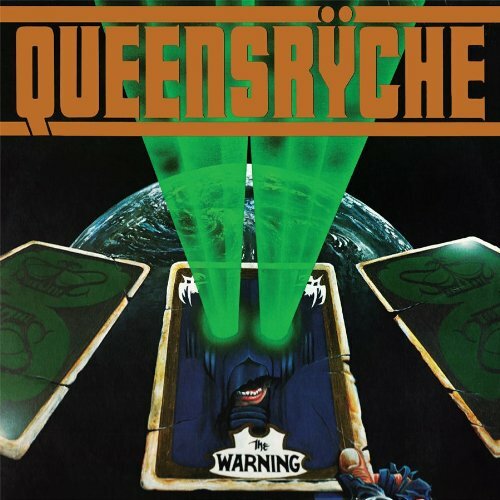 Upon conclusion "The Warning" is a high quality release and a great start to Queensrÿche career. The songwriting is still a bit immature and not all tracks stand out equally much although all tracks are of a good quality, but the high level musicianship and the relatively well sounding production pull in a positive direction. A 3.5 - 4 star (75%) rating is warranted. 1984’s The Warning is the debut studio album by the Seattle Based Progressive Metal band Queensrÿche. It was recorded in London and produced by James Guthrie who is notable for his work with Judas Priest, Pink Floyd and also Pink Floyd members’ solo albums. Compared to all other Queensrÿche albums, it is the most traditionally Heavy Metal of their works stylistically. It is also arguably the least Progressive of their early albums, although it still shows clear signs of ambitious songwriting and a desire to push the boundaries of the genre. ‘Road To Madness’ for example is an almost ten-minute track with acoustic sections, electric sections, a symphonic sounding back-up and even a few time signature changes towards the end. Unless you really don’t like the sound of classic Heavy Metal in the vein of Judas Priest, Iron Maiden, Dio and early Overkill then The Warning will be an instantly enjoyable album. The standard of songwriting is excellent and the tracks are all for the most part catchy and memorable with driving riffs, pleasing guitar solos and fantastic vocals from the impressive Geoff Tate. Highlight include ‘En Force’ ‘N M 156’ ‘Child Of Fire’ and of course the aforementioned ‘Roads To Madness. 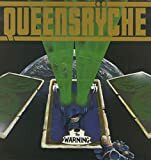 Overall, The Warning is Queensrÿche’s most straightforwardly metal album, and the band excels at delivering that style in a powerful, catchy and intelligent manner. I feel the album is pretty underrated and would happily recommend it to fans from a Metal background. If you like Queensrÿche and aren’t only in it for nothing but the Prog and the Prog alone, then you really should give the album a try. Like their self-titled EP, Queensryche's debut album finds them mainly influenced by the New Wave of British Heavy Metal, though with a few more of their more progressive instincts beginning to shine through than on the EP. Geoff Tate's vocals are uncannily like a mix between Bruce Dickinson's and Rob Halford's, and that's a good a shorthand for the musical style as any - a mingling of the then-current approach of Iron Maiden with the classic sound of Judas Priest's Sad Wings of Destiny or Sin After Sin. The group would move in a proggier direction on subsequent albums, but this album is still a decent listen for fans of classic NWOBHM groups. This is a good debut album, but not, for my money, the best Queensrÿche-album. "The Warning" strikes me as being very much influenced by the likes of Iron Maiden, but with inklings of that unique Q-factor (get it, eh?) that would later become characteristic of this band. Obviously less original than the albums to follow, "The Warning" is nonetheless a solid heavy metal album with progressive elements ubiquitously present, and tracks like "En Force", the title track and "Before the Storm" are very close to being heavy metal masterpieces. Geoff Tate's vocals are very acrobatic on this album, and fans of early Michael Kiske and John Arch are bound to be impressed by his vocal performance. Recommended to fans of Maiden-style 80s metal and early Fates Warning. If you were a Heavy Metal fan in 1984 the arrival of the debut album by Queensrhyche would have certainly have made you sit up and pay attention if you had the opportunity to hear it. Drawing inspiration from the Metal giants of the day, they had certainly listened to the likes of Judas Priest and Iron Maiden, yet there was more to Queensrhyche than most of their contemporise. The Metal riffs were there, though with a darker sound but they were augmented with light and shade making the Guitar riffs really hit home harder when they came in, despite a less than perfect production in the Guitar department. Lyrically Queensrhyche also have a darker edge and more intelligenty written than most other Metal bands then and now. Singer Geoff Tate has a similar Vocal style to Rob Halford reaching equally high notes as the histrionic Judas Priest frontman. Musically, as already mentioned they shared much of the same ground as Priest and Maiden but with more complex arrangements and were not afraid to stray out of the restrictions of a 4/4 time signature. Without picking out individual songs they are reasonably strong throughout closing with the excellent almost 10 minute long Roads to Madness. It's generally regarded that the roots of what has become to be known as Progressive Metal began with Queensrhyche (and Fates Warning) and the proof of that can be found here in places though at the time of release it was more regarded as thinking mans Power Metal yet it laid the foundations for what was to follow, not only from Queensrhyche but the likes of Dream Theater too who were to become arguably the most successful exponents of the genre. This is Queensryche's first full length album, produced after their very successful EP. Where the EP had been written by the band members and singer Geoff Tate recruited to sing, this album includes Tate's hand in the songwriting. This introduces more theatrics, more experimentation, but also replaces balls- to-the-wall riffing with more mid-tempo darkness. Tate had been working in progressive rock bands and reportedly had not wanted to do straight metal, but agreed after the success of the EP. The resulting sound begins here and climaxes with the iconic Mindcrime. I have been extremely impressed with how good the early albums sound when I go back to review them. First of all, the items that are not debated. Queensryche's sound is firmly based in 80's NWOBHM, most notably Iron Maiden and Judas Priest. Geoff Tate's voice reminds of Bruce Dickinson, Rob Halford, and occasionally Ronnie James Dio, and easily matches or perhaps eclipses all of his influences. Most of all, this is VERY good 80's metal, standing up with Powerslave, Screaming for Vengeance, and or any work by Dio. The biggest lack on this particular album is the loss of a driving, ahead of the beat rocker like their namesake track. Take Hold of the Flame, however, is an anthem of immense power that just smokes live. It's straightforward metal, but anyone who listens to that song and doesn't want to pump their fist, well, maybe they don't really get metal. NM 156 is the most progressive track, a mechanical vision of futuristic dystopia. Before the Storm also foresees progressiveness to come. But those looking for complex time signatures, rapid-fire mood changes or other prog-metal elements will be disappointed. The band does utilize many different 6/8 and other feels of 3 along with standard 4. The lyrical themes extend beyond most metal to a degree, but certainly aren't out of place in the genre. All in all, this is a very good metal album by a young band that will improve on their next release (Rage for Order) and hit pure magic on the subsequent album. Warning is essential for Queensryche fans and recommended for metal fans in general. No QUEENSRŸCHE THE WARNING reviews posted by members yet.